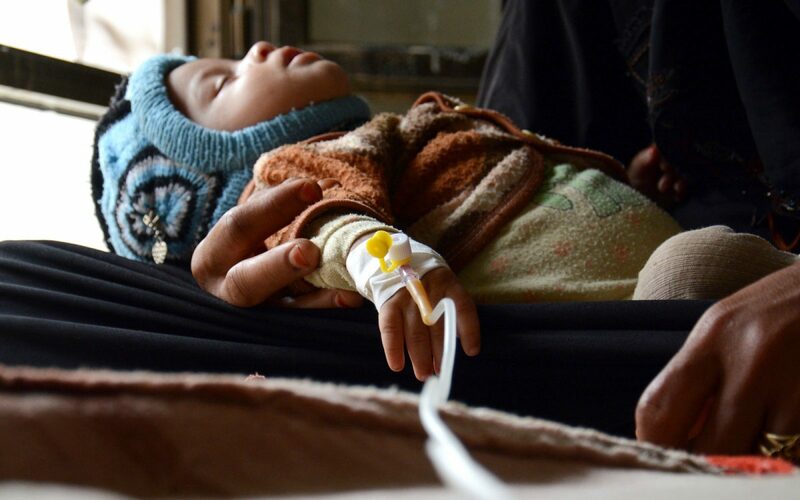 Besides the hunger and the expanding cholera epidemic Yemen suffers from the Saudi blockade. For more Information about the blockade please look at our latest press release or download it. Donations are possible at the bottom of the page. We often call it a “forgotten crisis”, but it is an unforgettable day-to-day struggle to survive for the people of Yemen. In the poorest Arab country, the world’s largest humanitarian crisis is currently taking place: 70 percent of the population is dependent on emergency aid, two million children are acutely under-nourished – yet there is not enough support for local people. Yemenis feel abandoned by the international community. Hunger – a six letter word describes the inhuman situation for more than 18 million people in Yemen. Hunger means not knowing when they will have their next meal, waiting in line for food vouchers, having to decide, if you can afford medical aid for one child or food for your other child. Decisions, which are neither easy to make nor should any one face. While hunger is already part of the daily struggle to survive, the population is now additionally threatened by the spread of cholera. In March, Vision Hope International launched a cholera management program with its committed employees. For this, we received a grant from the UN OCHA. Unfortunately, these funds are not enough – the situation is devastating. The health system has collapsed, hardly any facility is still fully functional. It is not enough to distribute medicines or detergents, thus producing hygienic conditions. There is no staff. There is a lack of functioning facilities. There is a lack of further financial resources. Our Yemeni staff on site give more than their best. On a daily basis they reach people with food and medical assistance. They do not give up hope. And yet, everyone is aware of it: without help they won’t be able to go on like this. Set a sign of hope. Make a decision today. Support the women and children in Yemen. Donate. Do you lack convincing arguments? How does that sound: 98 percent of your donation goes directly to the people in Yemen. 15 Jahren vor Ort und wir geben nicht auf. Continuous support since 15 years – we do not give up. The people in Yemen depend on your support.